Stereo AV Receiver allowing you to enjoy versatility with easy enhancement of TV, DAB+/FM/RDS radio, streaming services and more. Also available in Silver. 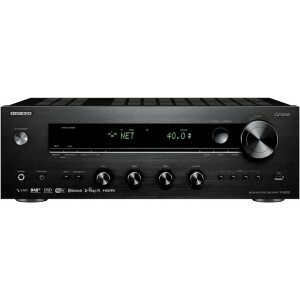 Onkyo TX-8270 Stereo AV Receiver, supplied in a sleek black finish, is a beautifully engineered stereo amp ready to play anything you throw at it. Together with line and phono inputs, it supports coaxial and optical digital, HDMI, USB and dual-band Wi-Fi to support wireless audio technologies. Built around a massive transformer, audio-grade capacitors, and discrete non-phase-shift circuitry locked and into a robust chassis, TX-8270 has effortless high-current, low-distortion driving power to illuminate your favourite music. High current assures accurate control, restoring energy and vitality to your music. Non-phase-shift circuitry, meanwhile focuses the audio image and reproduces a wide frequency bandwidth to maximise Hi-Res Audio and vinyl playback. A beautiful stereo receiver crafted for hi-fi enthusiasts, the TX-8270 is also exclusively equipped with connections allowing it to serve as an up-to-date amp for TV entertainment. Joining analogue, digital, phono, and USB inputs are HDMI terminals (connect an Apple TV or similar) together with a Next Generation Network Audio platform. Cast music from familiar apps quickly and easily. An AK4438 384 kHz/32-bit digital-to-analog converter from AKM features unique low-distortion technologies ideally suited to DSD 5.6 MHz and PCM signals up to 192 kHz/24-bit. Together with unique VLSC filtering circuitry, which eliminates ultra-high-frequency pulse noise, playback is crystal clear. Stream any music from your smartphone, laptop, or PC to your speakers with ease while controlling playback with Chromecast-enabled apps from your iPhone, iPad, Android phone or tablet, Mac or Windows laptop or Chromebook. A selectable 5 GHz Wi-Fi channel assures stable connectivity in areas with traffic congestion on the 2.4 GHz band. Enjoy smooth streaming over AirPlay, the Spotify Connect app, and other network audio services. FireConnect mirrors network audio and external analog sources connected to a master component on compatible speakers in other rooms from streaming services to vinyl records. Music selection, speaker grouping and playback management across the home is built into Onkyo Controller app for iOS and Android.